Permit me dear friends to share with you my thoughts and my experiences with ear piercing and tattooing. I am sure like me, many of you are eager and cannot wait to get the lowdown on these exotic, esoteric practices but did not know whom to ask. When I used to see people with their ears, foreheads, eyebrows pierced, and tattoos blazoned beautifully on all parts of their bodies, my thought was : Are these people crazy ? Sleazebags or what ? Being from an earlier generation ( God, how it hurts to admit), I only associated these practices with Popeye the Sailor and Fat old rednecks with ponytails/ bandannas round their heads riding equally fat Harleys. Truth to tell, I was always fascinated by Tattoos, and getting myself tattooed was always on my agenda, but the fear that something could go wrong always stopped me from getting this done. Let me start with piercing my ears : it is painful, but the pain goes off once the wound heals, which takes about 2 weeks at the most. 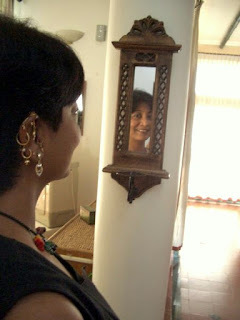 I am sure you all know of my love for piercing my ears : I have eight such in each ear ( 7 of them self inflicted ), and they all look very beautiful. My pierced ears with the accompanying doodads are invariably the topic of conversation with anybody who sees me, not only for the first time but even every time thereafter. In fact many of my facial imperfections go unnoticed because of my earrings, the focus being diverted to my ear and earrings. That's a good thing too, otherwise I would be bombarded with lots of unsolicited but well intentioned advice as to how get rid of my scars, pimples, blackheads etc., with all of which I am plentifully endowed. I don't remove the earrings everyday, and I have no problem sleeping with them. Just as I was crazy enough to have my ears pierced, I had an equally crazy desire to get my belly button pierced. I did a lot of research on the net looking for the best point at which to get it pierced ( Up ? down, sideways ? angle? etc. ), the pain factor, the essential after care procedures and so on. Finally one day, I mustered up enough courage to go ahead and get it done. I hit upon and settled for the dangling belly button ring, as it looked pretty, simple and cute. Then came the dreaded part of getting it pierced. I was mortally scared about the impending pain, about the slow healing process thereafter and worse, about things that could go wrong : possible pus formation, infection, inflammation and all those not so trivial little things started worrying me all of a sudden. However, I pushed aside all these nagging doubts and gave the piercing man the go ahead signal. I also made it very clear to him that he should make the piercing deep enough so that the ring does not come off at the slightest tug or when snagged with articles of my clothing. People close to me were allowed to take a peek at this wonderful thing. People were all praise for my courage, and kept on admiring it. I felt so proud to have finally done it. It was just maybe 1 month before my daughter's wedding, and during the wedding, all her friends wanted to have a peek at my belly button. At first I was embarrassed and hesitant to show it to them. But their oohs and aahs emboldened me to show it off to all comers, now with more confidence and unabashed pride. In the first few days I was mentally discomfited and physically felt some discomfort to have the ring dangling from the belly button – like an interloper. But I soon learnt to overcome these sensations, gradually getting used to the ring as being apart of me to a point that it was no longer bothersome or intrusive in any way. I was taking good care of it and it seemed to be healing well. Three months flew by uneventfully. Then one fine day it just fell off all of a sudden. Maybe, the piercing was not done deep enough, I don't know. I was so disappointed and dejected, depressed and sad. Even today, three years on, memories of the ring saddens me. For remembrance and solace I have only a photo of the ring taken when it first became part of me. Now I plan to have it pierced one more time and this time will choose the ring wisely. No more the dangling types for me, for I do feel the dangling type was also one of the reasons for it to fall off. Luckily the whole procedure did not cost me much. This time around I plan to get it done by a more experienced and qualified person : it might cost me a little more : but for me, having a ring around my belly button is certainly worth the time, effort and money spent on such an exotic ornamentation. I now come to the matter of getting a Tattoo. The belly button experience made me put off tattooing for a long time. Every time LA Ink, Miami Ink were aired on TV, I would watch the shows with utter fascination and rapt attention. Just watching the artists creating masterpieces made me want more and more to get myself also inked. My daughter and son in law both have beautiful tattoos, and both of them said it was not painful at all and their tattoos also healed beautifully. They told me not to be afraid, and I should get it done without a second thought. In September of last year a visit from my daughter along with her husband, finally made it possible for me to get tattooed. They had planned to get one more tattoo done on themselves, and insisted I too came along and fulfill my long pending desire. I just took the plunge, and went along with them. Since this was my first tattoo, I chose to keep it small and simple. 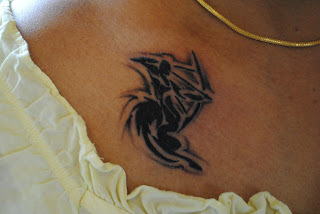 On the spur of the moment, I decided on Sagittarius - "The Centaur", because that is my astrological sign. I could have selected something more intricate, but then decided to take it easy the first time. The mythic centaur has the upper body of a man, and the lower body and legs of a horse. The icon shows an archer, an arrow, or occasionally a bow and arrow. This sign makes a great statement as a tattoo design of all the zodiac signs since I hold it to be the most fashionable and chic of all mythical creatures in the Zodiac. 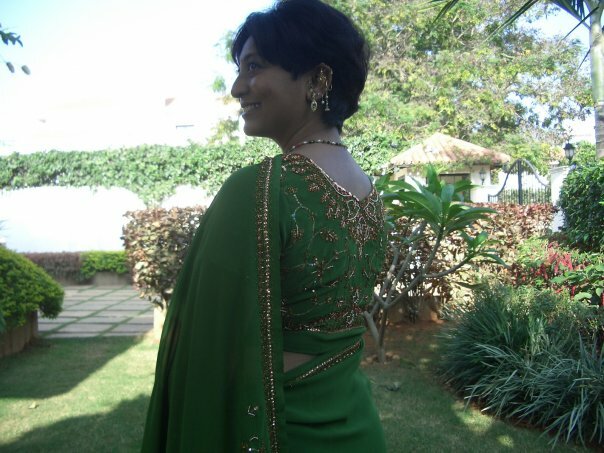 I got it done near my shoulder blades, and on my right side, so that it would be visible but not in a flashy sort of way even when I wear a saree, or some broad necked top. The tattoo artist of the studio we went to was very nice person with more than 10 years of experience in the art of tattooing, and knew his job well. He also had other experienced tattoo artists to work with him and they were all very good : each specialized in one particular facet of tattoo art. I learnt to appreciate the skill and the extreme patience, dedication of a Tattoo artist, and felt they deserved every penny of what they earn. One can become a Tattoo artist only if one has the flair for it, not every one has that in him/her. Seeing them from such close quarters was definitely a wonderful experience. They have to concentrate, and do it bending for hours depending on how big or intricate the work is, for in their job they cannot afford to make mistakes. That is why it is all the more important to go to a well established Tattoo studio. My Tattoo healed beautifully, convincing me that not all things in this world can go wrong. Even otherwise, I daresay I have the courage to tread into territory where no man has gone before, even when doubts nag. If I decide on something , I just plunge into it headlong, whatever be the consequences. My message to people who would like to experience these things, is to just go ahead and get them done, for you have only one life to live and live it to the full without any fear. Rama, Rama, there is more to you than meets the eye! What a complex and mysterious person you are! Now I have a question: In the photo of your house, in the upper opened window, there appears to be a wire going to the roof. What is that? Interesting article. My cousin also has many earrings and I find it fascinating that people would willing go through the pain. Thanks Mytri. It is just a pinprick, it heals very well, if we follow the basic routine of washing/ cleaning them with warm water and salt. Okay everybody need not go overboard like me, but if people want to pierce just 1/2 there is nothing to fear. I also started with one and felt I could take more and more till there was no place left. Wow!!! Amazing...so many ear rings? And i thought they were painful for you! Thanks CN. Yes, and now you know they are not so painful. It is much less painful than waxing or threading. Thank you Reshma, yeah, they have become a part of me. Glad to meet another Sagittarian. You look beautiful Rama..loved all the portraits, stunning ones! 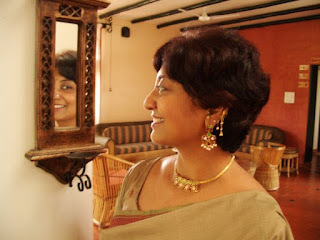 Padmaja, thanks a lot for the complements. Interesting reading, Rama! The design looks beautiful! I was thinking what to write, when this topic struck me. It is always good to know about these things from a person experienced in these things, isn't it? You know what you are getting into before itself. You surely are courageous, Rama! I also like your story about being pierced and tatooed. I like to see them on others (when not in excess, of course) but this is all. They are not tempting me. And yes, your earings are beautiful but so are you, Rama! Thank you TH. Yes some things are nice on others but we may not be nice on us, so true. 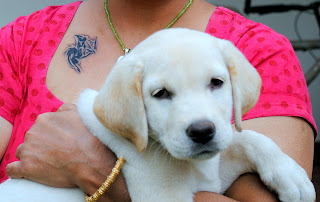 Rama you must be the coolest mom what with your tatoo and all :) !! 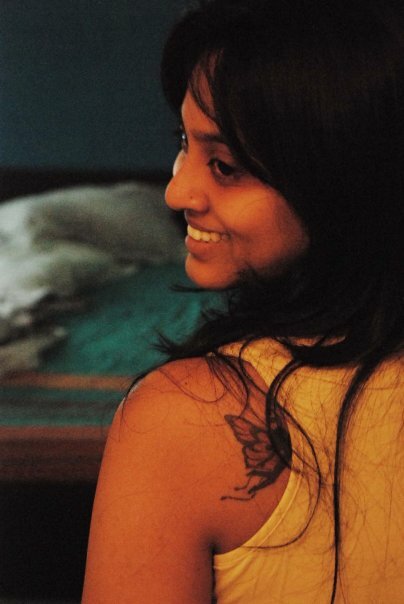 I used to be fascinated by tatoos too when I was in college. I wanted a small horizontal line on my forhead like the tribal women so that when I put my bindi on top it would make me look like a folk heroine (Or so I thought)!! I had my ears pierced around the side but I am not very comfortable with many earrings and when I was not regular with my earrings it closed up. My daughter and I now wanted our noses pierced - but I draw the line at the navel- I would be too concious and I think one needs a really flat tummy to carry that off - not possible for me!!! But kudos to you! Loved the pictures. You look lovely and so do those tatoos. Thanks Meera, for sharing your story here. Good thing you did not get the Tattoo done on your forehead, maybe you would not have liked later on. It is always better to think ten times before getting inked, and go through various designs, the placement etc., before deciding on one. It is not like ear piercing, where if the hole gets closed, you need not bother, but Tattoo is a permanent mark, and it is difficult and also very costly to remove it. BTW, I was also thinking that only if one had flat stomach a belly button would look good, but it not true it adds a charm to anybody with or without a flat stomach, that's the beauty of belly buttons. Even, I don't have washboard abs, but it looked very nice on me too. Unfortunately it fell off. Good luck on your nose piercing. See that it is pierced in the center and not lower. Mine was pierced a little lower, it doesn't look so nice, for the diamond nose ring to look beautiful it has to be pierced right in the center. Rama, you are so cool...love all your ear piercing. I so wanted to see the pic of that belly button ring. 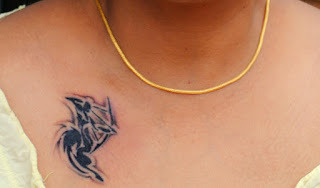 You are brave to have tattoo done... I would love to have butterfly like on leg above ankel but I am too chicken to do that...your looks fantastic. Thanks Nayana. I could not find the picture of the belly button ring. Don't be afraid, it is less painful than threading and waxing which all women do on a regular basis, believe me. I am sure you would just go and get it done soon, hubby or no hubby. Thanks, and welcome to my blogs. Enticing on you all these accessories. All the photos show that you attained motherhood at very early stages. Look charming.But I fear i may not be able to withstand the pain of sticking sharp objects on me. Thanks Rahul. Yes one must not let go experiencing the things we want to experience. Oh loved your post Rama, or I should say your experience. Always enjoy reading your posts. Loved your saying, "...just go ahead and get them done, for you have only one life to lead and live it to the full without any fear." You do look pretty with those earrings and of course the tattoo. I'm quite inspired by your experience. There was a time when I wanted to pierce my nose, but never had the courage to go ahead with it. My daughter pierced her nose, tried to convince me, yet I couldn't. Thanks. I am glad, that i inspire you.I am sure you can get your nose pierced without any difficulty, if your daughter could do it, you would also be able to do it, if you really want to. 8 Piercings in the ear... Oh My God! and you said self inflicted?? Meaning you pierced on your own?? Amazing!! I have 3 piercings in each ear. And your tattoo is so cool! I will go for a tattoo sometimes... This made for a very interesting read. Thanks for tips and suggestions! Self inflicted doesn't mean I pierced them myself. Thanks for dropping by. Bold and funky! I can imagine how cool you would look with all the pretty jhumkees dangling from your ears!